When Hudson's Uncle Vic's apartment catches on fire, it sets a lot of things into motion. Vic moves in with Hudson and his mother, which makes things crowded and leads to lots of vegan dinners. Hudson is not playing hockey because he has gotten too tall, and he is trying out for the school basketball team. So is Trevor, his best friend who is not talking to him because Hudson blew off Trevor's martial arts competition, and Willow, a girl whom Hudson finds interesting. For his career exploration class, Hudson has agreed to research firefighters, and gets an opportunity to talk to the fireman in charge of the investigation of Vic's fire. Unfortunately, it looks very suspicious, and Vic's health problems are, too. Hudson starts to wonder-- could his uncle be into drugs? And what about his father, whom his mother refuses to mention. Are drugs the reason why? As try outs start in earnest, Hudson finds himself having more and more troubles with his "childhood asthma" which he has always hoped would go away. Are his breathing difficulties related to his uncle's or his infant brother's, who died when Hudson when 2? Will his asthma keep him from being on the basketball team, or from being a firefighter when he grows up? Since he's irritated by his medical concerns as well as his mother, who is conscientiously overbearing, Hudson has trouble smoothing things over with Trevor, and starting things with Willow, who seems to like him. 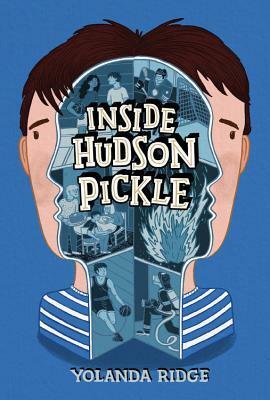 Middle school is tough enough, and Hudson needs to find a way to deal with his family problems and keep on top of things at school. Strengths: There were several interesting topics covered in this book, but they were presented in an intriguing fashion and written about in an engaging way. The book starts with the fire, and I loved that while Hudson knew full well that it was A Bad Thing, he couldn't help but be excited about his uncle moving in with him! The interactions with Willow were perfect-- embarrassing, but completely understandable. I found myself really interested in Hudson's medical problems, probably even more than I was about his father. The tone of this was generally upbeat, but in a typical irritated, middle school way. Working in both hockey and basketball is inspired. I enjoyed this a lot, and think the cover is great as well. Weaknesses: I found it hard to believe that Hudson's mother would have told him NO information about his father. What I really think: Definitely look forward to more books by this author. Since she's Canadian, I'll definitely hope for a good middle grade book about a boy playing hockey. I need more than the Sigmund Brower titles! Finally, a book on asthma!